This movie was ridiculously similar to Jaws. It featured a giant sea creature attacking humans (a moray eel and a bunch of tiger sharks). It starred Robert Shaw (Quint in original Jaws) and Louis Gossett Jr (Bouchard in Jaws 3D). And it was based on a book written by Peter Benchley. Not sure how much more similar you can get. The movie also starred the gorgeous Jacqueline Bisset and an impossibly young Nick Nolte. 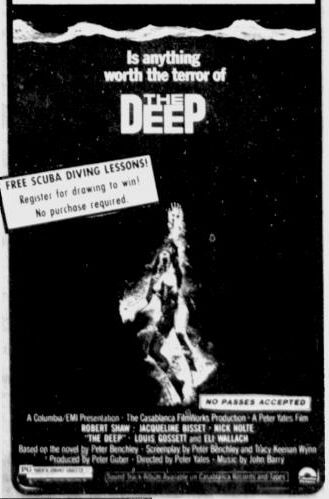 I love the offer of free scuba lessons. I'm not sure how many people would actually want to go scuba diving after watching this movie.